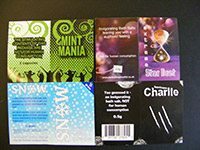 New psychoactive substances (NPS), often known as ‘legal highs’ ‘illegal legals’ or ‘illegal highs’, are substances designed to produce the same, or similar effects, to drugs such as cannabis, cocaine and ecstasy, but are structurally different enough to avoid being controlled under the Misuse of Drugs Act. In the past they were often sold in the shops as research chemicals and advertised as ‘not for human consumption’ to get round the law. In some cases, NPS are just as dangerous as controlled drugs. NPS are normally sold as powders, pills or capsules. The powders can range from white to brown to yellow in colour and from flour-like to little crystals in consistency. While the pills and capsules can range in size, shape and colour. The smoking mixtures tend to come in colourful packaging, often with labels describing the contents as incense or herbal smoking mixture, and the contents look like dried herbs or plant cuttings. Although they look herbal, they are actually plant material sprayed with potent chemicals. NPS tend to be snorted or swallowed, but there have been reports of some people injecting NPS, which is the most dangerous way of using. NPS smoking mixtures are either smoked in a ‘joint’ or by using a pipe/bong. Because NPS include lots of different substances and what’s in them can change, often the immediate effects can vary. There is the possibility of accidental overdosing as the strength of some substances is unknown. Whilst drugs in each of the categories will have similarities in the kinds of effects they produce, they will have widely different strengths. Stimulant NPS act like amphetamines (‘speed’), cocaine, or ecstasy, in that they can make you feel energised, physically active, fast-thinking, very chatty and euphoric. ‘Downer’ or sedative NPS act similar to benzodiazepines (drugs like diazepam or Valium), and like cannabis or GHB/GBL, in that they can make you feel euphoric, relaxed or sleepy and reduce inhibitions and concentration, making you feel forgetful, and can slow down your reactions. Psychedelic or hallucinogenic NPS act like LSD, magic mushrooms and ketamine. They create altered perceptions and can make you hallucinate (seeing and/or hearing things that aren’t there). They can also induce feelings of euphoria, warmth, ‘enlightenment’ and being detached from the world around. One of the difficulties around NPS is that we can’t say for certain what’s in the product. Even when we can, the chemical may not have been used for human consumption before and its short or long term effects are likely to be unknown. There has been limited research into the short, medium and long term risks of the various NPS. However, it is becoming increasingly clear that they are far from harmless and can have similar health risks to drugs like cocaine, ecstasy and speed. Risks of NPS include reduced inhibitions, drowsiness, excited or paranoid states, psychosis, hallucinations, dizziness, sickness, overheating, coma and seizures. Many NPS have been directly linked to emergency hospital admissions and, in some cases, deaths. NPS can have very different effects on users and risks and side effects are increased if used with alcohol or other drugs. One type of substance can also be much stronger than another and this has often led to accidental overdosing. Stimulant NPS can make you overconfident and disinhibited, and can induce feelings of anxiety, panic, confusion, paranoia and can even cause psychosis. They can put a strain on your heart and nervous system. They can effect your immune system so you might get more colds, flu, sore throats or infections. You may feel quite low for a while after stopping using them. ‘Downers’ can make you feel lethargic, or forgetful, and can make you physically unsteady and at risk of accidents. They may cause unconsciousness, coma and death, particularly when mixed with alcohol and/or with other ‘downer’ drugs. Some people feel very anxious soon after they stop taking ‘downers’, and if a severe withdrawal syndrome develops in a heavy drug user, it can be particularly dangerous and may need medical treatment. Psychedelic or hallucinogenic NPS can make you hallucinate. Some strong hallucinatory reactions (‘bad trips’) can lead to the person acting erratically, sometimes without regard to their safety. Some psychedelic drugs create strong dissociative effects, which make you feel like your mind and body are separated. Both of which can interfere with your judgement, which could put you at risk of acting carelessly, dangerously, or hurting yourself or others, particularly in an unsafe environment. Injecting any drug, including NPS – and sharing the equipment used for injecting, such as needles or syringes – runs the risk of the person injecting catching or spreading a virus, such as HIV, hepatitis B or hepatitis C. There is also the risk that veins may be damaged and that an abscess or blood clot may develop, which can cause further health problems, like infections and heart problems. The UK Psychoactive Substances Act came into effect on the 26 May 2016, which banned NPS. This legislation makes it an offence to produce, supply, offer to supply, possess with intent to supply, import or export (including over the internet) any psychoactive substances. Possession of a psychoactive substance is not an offence, except in a ‘custodial institution’ such as a prison or young offenders institution. Products such as nicotine, alcohol, caffeine, food and medicinal products are exempt from the Act. The Home Office has also said that “Poppers” or alkyl nitrates do not fall under the Act. Supplying NPS to someone else, including your friends, or buying them from internet sites based abroad to be delivered here, can mean you can get a prison sentence and/or a fine. The maximum custodial sentence available in a solemn prosecution under the Psychoactive Substances Act 2016 is 7 years. The legislation gives powers to law enforcement to take action against all suppliers of NPS. There are provisions for civil sanctions, prohibition notices, and prohibition orders to enable the police and local authorities to adopt a proportionate response. The Act doesn’t replace the Misuse of Drugs Act (1971) so laws around existing illegal (controlled) drugs will remain the same. Learn more about drugs and the law. Get the facts on new psychoactive substances, or so called "legal highs"